hmm, very interesting! i’ve always wondered if i could make my own cream cheese. is this something you could use just like store-bought cream cheese, like let’s say, in a cheesecake? thanks! I made this batch of CCC to make CCC Ice Cream, recipe forthcoming on NOLAcuisine.com! I do think that homogonized does not play a role here as skim milk has no fat(or very little) to be homogenized. I find homogenized whole milk works well for mozarella and ricota cheeses. This sounds like the perfect recipe for using raw milk. The milk is not heated to the point of killing the enzymes and the health benefits remain. Don’t throw away the whey! Use it for baking breads. Replace any liquid called for with whey. 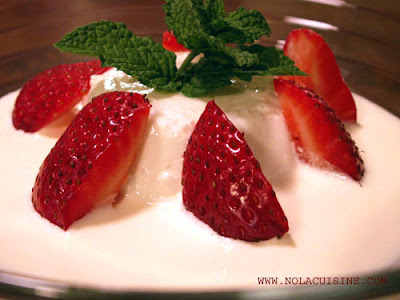 I have been making Creole Cream Cheese for quite a few years now. I started with a recipe similar to this but it was not the product I loved as a child in the 1950s so I modified it until it was right. This is he recipe I have used for abut 9 years now. Dissolve Rennet in 1 oz. filtered water. Pour Milk into non reactive bowl and add buttermilk and salt. Whisk lightly to dissolve salt. Add dissolved Rennet and whisk to mix well. Cover with Cheesecloth or Tea Towel and set undisturbed at room temperature. In 24 – 36 hours scoop curd into cheese molds and place over tray in refrigerator for at least 12 hours. Remove from molds and place in small margarine or cottage cheese containers with lids. Add Half and Half or Whole Milk before serving. This recipe makes a firmer cheese round that is more like the Borden, Walker Roemer or Muller’s Milk recipes of the early 1950s. I was looking for a recipe for creole cream cheese for a cheesecake recipe that i want to try. I had never heard of or had CCC before, i’m trying your recipe (started it last night). I didn’t have skim milk, only whole milk , so that is what I used. am i shooting myself in the foot? The temp in my house is on the cool side. will that affect the coagulation of the milk? I’m not sure what to expect, so i feel a little anxious about the outcome. i am really enjoying your site, any food that is NOT midwestern blah interests me. Last year I got a recipe off your wed sight and I have lost it.